When you start your dental practice, you want to be sure that you're fully covered legally. Just like purchasing malpractice or disability insurance helps protect you in the event something doesn’t happen as planned, setting up the legal structure of your dental practice correctly will also help protect you. Why Set Up a Legal Entity? When you set up a legal entity for your dental practice, you're able to separate yourself from your practice. Not only is it a necessary step in creating your practice for the first time, it helps offer several layers of protection to both you and your business. Setting up that important legal entity has several key advantages that should not be underestimated. Business credit is separated from personal credit. Chances are, you took out several loans to make it possible for you to start your dental practice. Creating the right legal entity can help separate those loans from your personal credit. Failing to do so, on the other hand--as in a sole proprietorship--can leave your credit bearing the burden of those loans, which can leave you struggling to get a mortgage or purchase a new car. Your legal entity provides you with personal legal protection from both sides. Separating your business and your personal life, legally speaking, helps provide protection in both your business and your personal life. Suppose you are sued personally: you're involved in a car accident in which you are at fault, you default on your mortgage, or you are involved in a legal dispute, for example. In this instance, the individuals who are suing you will be unable to go after your practice. On the other hand, if your practice is sued--someone slips and falls on the premises or there's a medical malpractice case--they won't be able to come after your home, car, or other personal finances. Creating a legal entity makes it easier to see the business's accounts. Your dental practice should have its own bank account, its own tax forms, and other key information that will keep it separate from your personal finances. This enables you to easily display your financial information on your taxes, but it also makes it easier to someday bring a partner into your company. You know that your dental practice needs to be set up as a business--but which type of business should you choose? Each type of legal entity has its own benefits, and fully understanding them can help you better choose the right one for your practice. 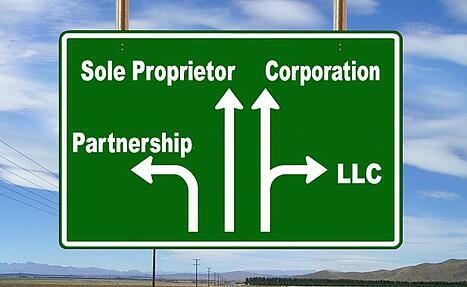 Sole Proprietorship: A sole proprietorship is easy to set up, especially if you're going into practice by yourself. You're able to report your income and losses on a 1040 tax form, rather than having to use a more complicated setup. That also means that you're able to claim those early-year losses on your own taxes and benefit accordingly. Unfortunately, operating as a sole proprietorship has several disadvantages: you're able to be personally sued for medical malpractice, it's hard to separate your business finances from your personal ones, and your personal credit may take a hit, especially if your practice doesn't thrive as well as you'd hoped. You'll also find that you, personally, bear the full tax consequences of your practice's success or failure throughout the calendar year. Professional Corporation: When you set up a professional corporation, it's easy to separate your finances from your business. They are still very straightforward but require more paperwork than a sole proprietorship--including annual meetings. Professional corporations allow you to receive medical insurance through the company, but you'll have to pay franchise taxes through the corporation. This strategy is most effective if you plan to eventually bring a partner into your practice or if you want to start out in partnership with another dentist. If you are working with a partnership, on the other hand, setting up your practice as a corporation can also help provide additional layers of protection that will prevent every member of the practice from being impacted should one member be sued for malpractice. If you choose to set up a professional corporation then you also need to make an additional decision regarding whether to elect to be taxed as an s-corp or a c-corp. Although this decision should be made with the assistance of your CPA, a vast majority of dentists elect an s-corp because there’s only one level of taxation versus dual taxation. One tax is almost always better than two taxes. Professional Limited Liability Company (PLLC): A professional limited liability company, or PLLC, helps separate you from the financial responsibilities of your practice and keeps your finances safe from it. It has a basic structure that makes it easy to get it up and running. Financial gains and losses are still reported on your personal taxes, but your liability is limited in the event of financial trouble with the business. A professional limited liability company ensures that all of the members who are part of the company are professionally licensed in the dental field. A single-member LLC can be taxed either as a sole proprietorship or as a corporation, so make sure you work with a qualified accountant to ensure that you're making the best choice for your business and personal finances. It is important to note that PLLCs are not allowed in many states (e.g., California), so make sure check with a dental attorney. Making the right legal decisions for your dental practice is a big step, but it will also help protect both you and your practice in the event of financial and legal difficulties down the road. If you aren't sure what legal setup is most effective for your dental practice, take the time to work with an accountant who will help guide you to the most effective, responsible decision for your practice and your personal needs. Alternatively, feel free to call me with any questions.